But seriously, what could be better than the library? I used to practically live at the library as a kid–although now, more often than not, I click on over to Amazon and buy a new book rather than walking six blocks to check one out. Bad me. That’s a pretty atrocious habit of convenience that I have slipped into, and one that, with the urging of Kareem, have decided to abandon. Even though I always try to pass my books on, I am still encouraging the production of more stuff thus depleting resources, and my new book passed on will surely still have a shorter shelf life than one repeatedly circulated through a library. So the bottom line is this, borrowing books from a library saves trees and reduces resource consumption. I knew this, it just took the American Library Association to jog my habit-riddled brain a bit. And I’d like to point this out as well: Libraries offer more than books. They have magazines, audio- and videotapes, computers, software and other multimedia materials. Libraries offer a wide range of other items on loan to children and their families, including toys, games and puzzles. 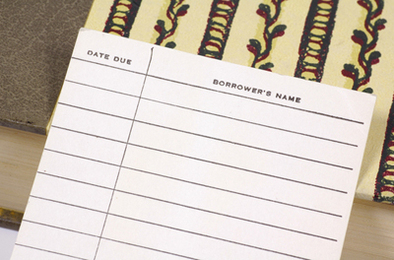 Most can be borrowed for home use simply by showing a library card. OK, sold. (Although Kareem had me at “hello.”) To find your local library, visit Libraries.com, and also don’t forget to check out Presidential Libraries, College and University Libraries, and note that many museums even have libraries. I check out so much from my local library. Books. Movies. Tv shows. CDs. Magazines. Comic books. Just remember to always turn things in on time or you'll have a fine for each overdue item! Thank you Melissa, for Sharing this!